You can find Real Good Foods at their online store or on Amazon. Their pizzas are offered as a chicken crust pizza or a cauliflower crust pizza. Amazon currently has a $15 off clippable coupon. Real Good Foods offers up a great gluten-free, low-carb pizza. I haven’t tried the cauliflower crust yet but I sure do love the chicken crust pizza. Because they use chicken and cauliflower in their crusts you are not going to find any gluten in these and very few carbs. These pizzas are also great for those following a keto diet. You can also check out their gluten-free, low carb enchiladas that are available. They are fantastic for lunch! If you prefer to purchase your pizzas in-store simply click this banner below for the Real Good Foods handy store locator. Paleo Powder is a brand that I know and trust to deliver a wholesome, quality product. I have used their Paleo Powder Pink and Paleo Powder Original All-Purpose Seasoning to flavor many of my recent dishes. This variety pack contains both of those seasonings and also includes Herbed Salt-Free and Low FODMAP. You can read more about how I used Paleo Powder to season my chili and whip up the best batch ever. The wonderful thing about these Paleo Powder seasonings is that they only use all-natural ingredients in their seasonings. You will not find any artificial flavors or food additives lurking here. All of Paleo Powder seasonings are free of MSG and GMOs and they are manufactured in a wheat, soy, and milk-free facility. These seasonings are certified Paleo and can be incorporated into all of your healthy meals. They are very versatile. You can also shop for Paleo Powder in their online store. This here is a brand that I love and trust to come through with a great-tasting, quality product. Caulipower serves up a gluten-free and paleo product here with their baking mix, that I have yet to try! It has 11 net carbs per serving and has a 1/3 less amount of calories and fat than traditional baking products. This would be the perfect grain-free mix for your next baking project! I am thinking this would be great for a homemade pizza crust. Read my review ofÂ Caulipower (Gluten-Free) Pizza and check out my recipe for a Greek pizza made with Caulipower cauliflower crust. If you hang out on Instagram a lot then chances are you have heard about Legendary Foods and their line of gluten-free, keto, no-sugar-added nut butter. Instagram is where I first heard about them. They have an incredible line of healthy nut butter that you can feel good about eating without all the guilt. This variety pack is available on Amazon and includes Peanut Butter Chocolate Chip, Pecan Pie, and Blueberry Cinnamon Bun. 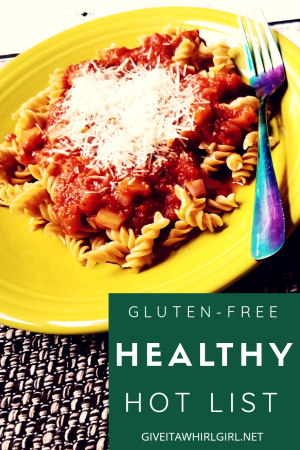 These gluten-free pastas from Banza were created with chickpeas. They are gluten-free and packed full of protein. This pasta also gives your fiber intake a much-needed boost and they are slightly lower-carb than traditional pasta. This variety pack from Banza includes many different shapes of pasta so you can get started on your next gluten-free pasta dish! Includes shells, penne, and rotini-shaped noodles. Check out my gluten-free Italian Sausage Goulash recipe on my blog that I created with Banza pasta. If it is Whole 30, then you know it is gluten-free! Primal Kitchen is one of my go-to brands that I use often in the Give It A Whirl Girl kitchen. You can read my review of their products on my blog. These products by Primal Kitchen are always gluten-free and many are also paleo, keto, and Whole 30 friendly. This Whole 30 Starter Kit is perfect for getting started with their products. It includes: Avocado Oil, Greek Dressing/Marinade, Ranch Dressing, Chipotle Lime Mayo, and Avocado Oil Mayo. You can also shop at Primal Kitchen’s online store and save 10% with coupon code GIVEITAWHIRL10. As many of you may know, I am a huge fan of Enjoy Life Food’s dark chocolate chips. They are great for baking projects. I do have a confession to make as well, they are great for nibbling and snacking on straight out of the bag. Busted! I have not had a chance to try out Lily’s Sweets Premium Dark Chocolate Baking Chips yet but they rank quite high on my list of foods that I would love to try. I recently tried a Lily’s Sweets dark chocolate bar and it was love at first bite. This bag of chocolate chips is sweetened with Stevia and these chips are also vegan and free of GMOs. This Swerve Chocolate Chip Cookie Mix is for the health-conscious person. Not only is it gluten-free but it is also low-carb and ketogenic. One baked cookie comes in at 110 calories, 2 grams of added sugar, and 12 carbs. I have not given this product a whirl just yet but if you have I would love to hear your thoughts on it. I love this keto bark by ChocZero. I have not yet tried this hazelnut flavor but I have tried the almond bark. Other flavors available are peanut and coconut. This chocolate bark is sweetened with monk fruit so there are zero added sugars in this gluten-free chocolate bark. This is a line of chocolate you can enjoy with peace of mind because there are only 3 net carbs per serving. These birthday cake flavor sandwich cookies from Goodie Girl really caught my eye and stood out for me. Birthday cake flavored items rank pretty high on my list of favorite foods. It is just something about birthday cake, maybe it is the nostalgic feeling of eating it when I was a little girl? Birthdays are all about happy times and a celebration and I think that is why they always put a smile on my face. These cookies are gluten-free and they are also made with all-natural candy sprinkles as well. You won’t find any artificial flavors or colors in these cookies. Goodie Girl only uses the best all-natural ingredients to create their cookies. There are a ton of great flavors available (way too many to list here!!). So click the image below to see what is available and go ahead and treat yourself! Everyone knows that maple syrup is chock full of sugar and carbs and it is best to avoid if following a diet that is low in sugar. Know Foods has a solution though! Their maple syrup has 0 net carbs and only 10 calories per serving. WOW! This stuff goes great on your stack of gluten-free pancakes or waffles. It is a fabulous alternative to regular maple syrup. I am a big fan of their products and first discovered them through their line of cookies. You can grab a variety pack of their gluten-free cookies on Amazon and enjoy some cookies without worrying about allergens and guilt! They also have chickpea, gluten-free pasta available. Which of these gluten-free foods from this shopping guide are you most eager to try? Leave me a comment and let me know what is on your wishlist! This entry was posted in Friday Faves, Health and Wellness, Shopping Guide and tagged avocado oil mayo, baking, Caulipower, chocolate, chocolate bark, chocolate chip cookie, ChocZero, cookies, dressing, gluten free, glutenfree, Goodie Girl, healthy food, Healthy Hot List, keto, ketogenic, Know Foods, Legendary Foods, low carb, maple syrup, marinade, no added sugar, nut butter, paleo, paleo food, Paleo Powder, pizza, primal kitchen, Real Good Foods, seasoning, Swerve, whole 30. Bookmark the permalink. We don’t have to eat gluten free. I like to keep things on hand or have recipies to make for our friends who do need gluten free foods. That is really awesome of you that you keep some gluten-free foods on-hand for your guests. 🙂 I recently discovered that I have a gluten sensitivity and I try my best to avoid it. It is very challenging to eliminate it from your diet. I have no eliminated it 100% but when I do eat it I pay the price afterwards. I have never heard of the Paleo Powder seasonings. I will have to give them a try as I am always looking for a new seasoning set! I love anything with cauliflower! Definitely have to try those!